Ven Pongal – This South Indian breakfast recipe made from rice and lentils is a great way to start your day. Pair it with sambar and chutney for a complete gastronomical experience. The first time I had Pongal was at a South Indian Restaurant in New York. Contrary to all my expectations of being served a bland mix of rice and lentils, what I received was bliss in a bowl. 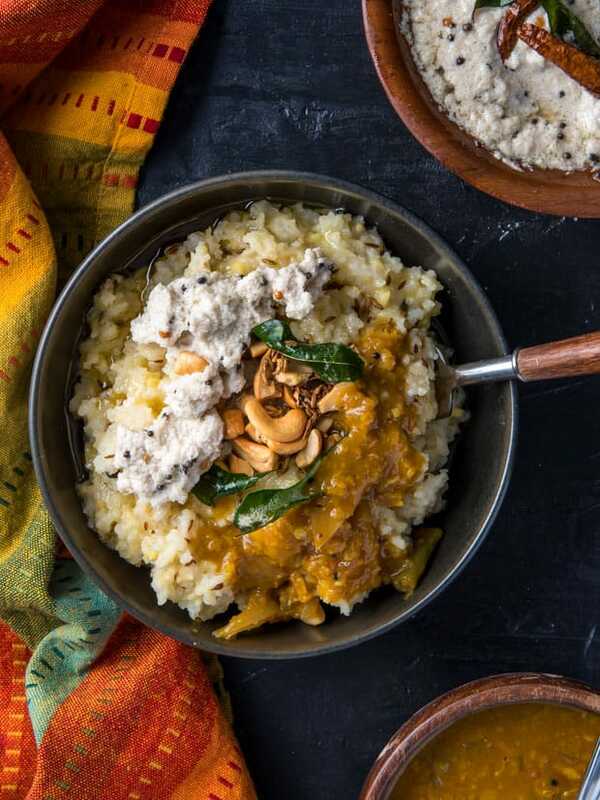 With a smooth porridge-like consistency, the Pongal was freshly made, served piping hot, and topped with a tempering of cashews, curry leaves, pepper, and ghee. With the first spoonful, I was hooked to its savory taste and since then, it has become part of our weekly rotation. This simple and easy dish is a common and popular breakfast dish from South India. It is not very different from Khichdi – popular rice and lentil porridge commonly cooked in the Northern part of India. Ven Pongal is often served as prasad (offering to god) in temples and ashrams across the country. It also has a cultural significance during the Pongal festival. Around mid-January, the day the sun transits into the sign of Capricorn is considered an auspicious one for Hindus across the Indian Subcontinent. It marks the beginning of a 6-month auspicious period called Uttarayana when the days become longer and warmer. Also, it is around the same time crops are harvested in India and as a way to express gratitude to God for a good harvest, celebrations are held all over the country with regional variations. In parts of Northern and Western India, it is celebrated as Makar Sankranti, in the East, it is called Bihu, and it is called Pedda Panduga in Andhra Pradesh, Sankranti in Karnataka and Thai Pongal in Tamil Nadu. Like all festivals, special dishes are cooked on this day using the newly harvested grains. In Tamil Nadu, Thai Pongal (also known as Pongal) is a 4-day festival. The word Pongal means boiling over. Boiling over milk is considered auspicious and signifies prosperity. That’s why on the second day of Pongal, rice and milk are boiled in earthenware and is then allowed to overflow. Everyone shouts “Pongalo Pongal!” which means “May this rice boil over,” while praying for an abundance in harvest, fortune, and prosperity. Jaggery, cashews and roasted moong dal are added to the remnant milk and offered to God before serving the rest to the family members. This is the sweet version of Pongal known as Sakkarai Pongal, and the savory version is called Ven Pongal in Tamil Nadu. This post would be incomplete without a shoutout to my friends Preeti and Shobhna for answering my incessant questions on Pongal :-). Thanks a ton, ladies! Note – The classic recipe of Ven Pongal uses seeraga samba rice – an aromatic variety of small-grained rice found in South India. If it is not readily available, feel free to substitute this variety with either Sona masoori or Basmati rice without impacting the cooking time. 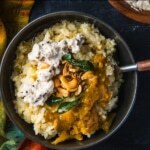 The traditional recipe to Ven Pongal involves roasting rice and moong dal before pressure cooking with water, grated ginger, and salt till it turns into a soft, mushy porridge. 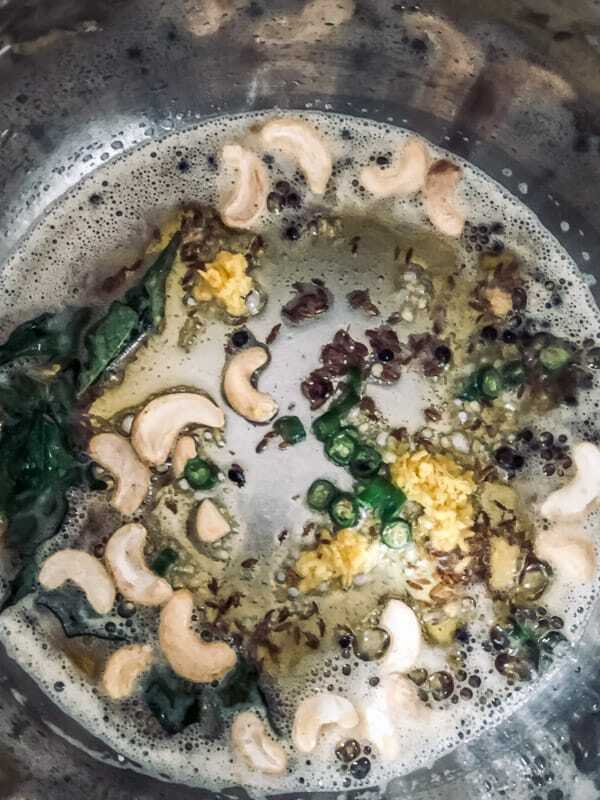 The next step is the tempering process – cumin seeds are added to hot ghee and when it starts to splutter, cashews, curry leaves, asafoetida, green chilies, and peppercorns are added to it. Saute them for about a minute or so before pouring it over the Pongal. To amp things up, add a dash of freshly ground pepper and mix well. To make it a one-pot recipe, start with the tempering process in the Instant Pot. 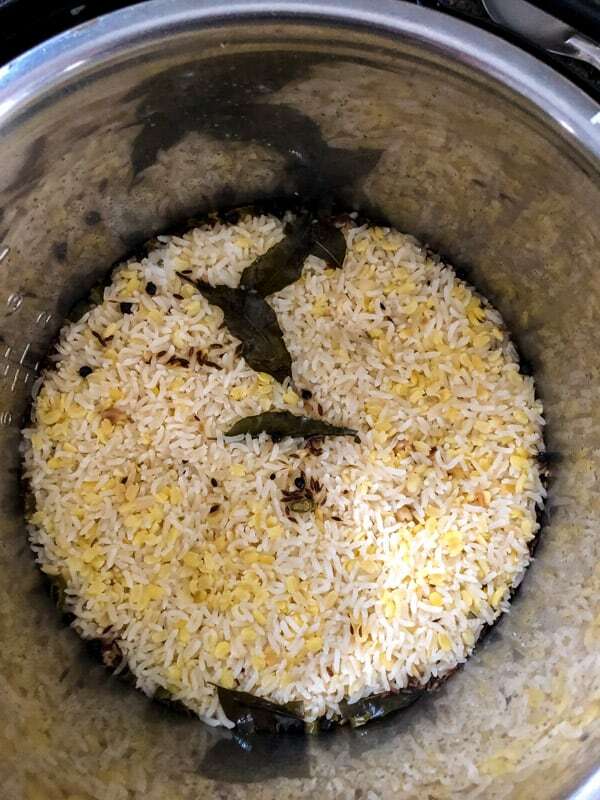 Follow it by roasting the dal and rice for a couple of minutes. Then add water, salt, and ginger and pressure cook the mixture. Serve immediately. It is a perfect recipe for families who are pressed for time but would like to enjoy a wholesome meal in under 30 minutes. Wash and rinse the dal using a colander and set aside. Set the Instant Pot to ‘Saute’ mode and adjust the setting to ‘More’. When the display reads ‘Hot’, add ghee. Once the ghee heats up, add cumin seeds and whole black peppercorns. Once the cumin seeds start to splutter, add curry leaves, asafoetida, green chilies, ginger, and cashews. When the cashews turn golden brown, add the rice and dal and mix well. Saute them for a minute or two before adding water and salt. Mix well. Cover the lid. Close the vent and set it to the sealing position. Pressure cook under high pressure or use the Porridge mode and set it for 10 minutes. Once cooking is complete, allow the pressure to release on its own before opening the lid. Mix well and serve immediately with sambar and coconut chutney. 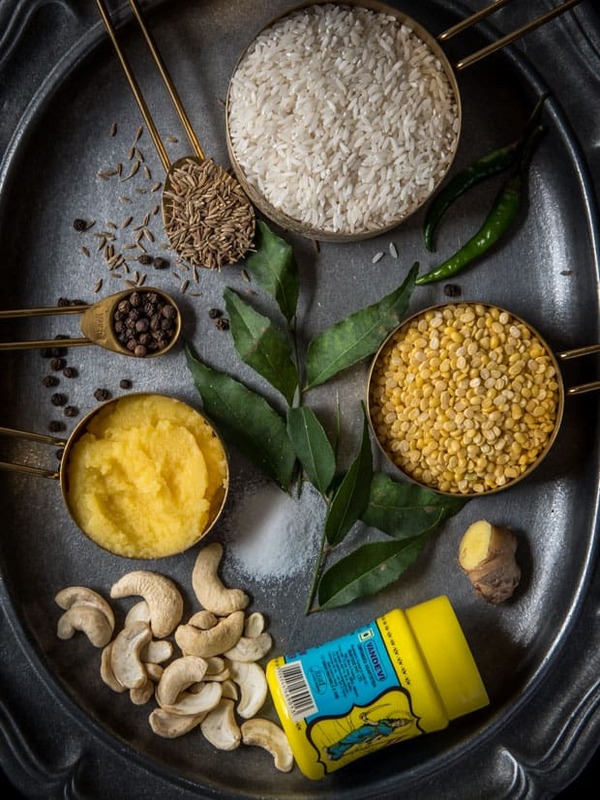 For the best tasting Ven Pongal, don’t skimp on ghee. If you are vegan, coconut oil is a good option. Ven Pongal tastes best when had immediately because the porridge thickens quickly (in less than 30 minutes). To bring it back to its original consistency, add water and mix well. The amount of water depends on the quantity of Pongal. For instance, use a couple of tablespoons of water for a small bowl of Pongal. 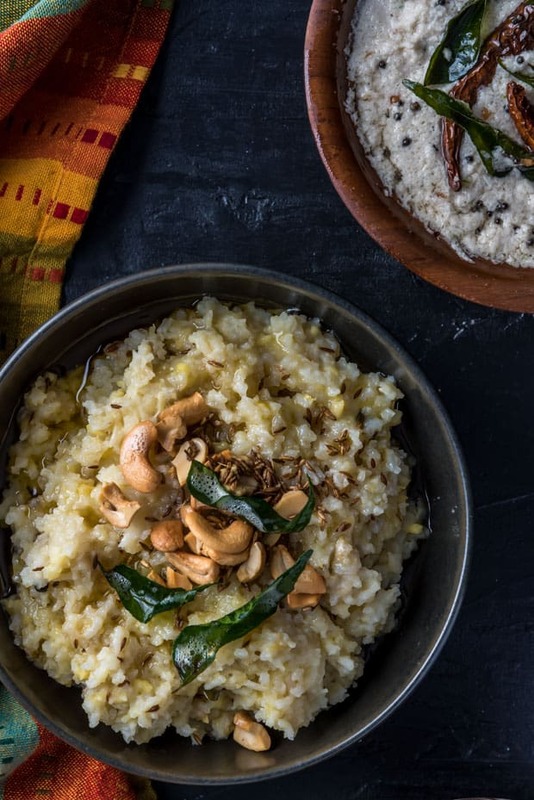 Ven Pongal makes for a delightful dish when served with sambar and coconut chutney. 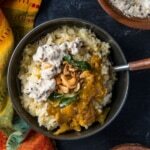 Ven Pongal Recipe - This south Indian breakfast made from rice and lentils is a great way to start your day. Pair it with sambar and chutney for a complete gastronomical experience. Wash and rinse the dal and rice using a colander and set aside. Set the Instant Pot to 'Saute' mode and adjust the setting to 'More'. When the display reads 'Hot', add ghee. Once the ghee heats up, add cumin seeds and black peppercorns. As the cumin seeds start to splutter, add curry leaves, asafoetida, green chilies, ginger, and cashews. When the cashews turn golden brown, add rice and dal and mix well. Saute them for a minute or two before adding water and salt. Mix well. Close the vent and set it to the sealing position. Reheating instructions - To reheat refrigerated Ven Pongal, add a couple of tablespoons of water, mix well and microwave it for a minute. If you prefer the traditional way of adding the tempering at the end, follow this process. Pressure cook roasted dal and rice along with ginger and salt in a pressure cooker. The next step would be the tempering process - cumin seeds are added to hot ghee and when it starts to splutter cashews, curry leaves, asafoetida, green chilies, peppercorns are added to it. Saute them for about or so before pouring it over Pongal.